Impressive speed – it is ten times faster than Hadoop if data is processed on a disk and up to 100 times faster if data is processed in memory. Stream processing – with the advent of new technologies such as the Internet of Things it is not enough to simply to process a huge amount of data. Now we need processing a huge amount of data as it arrives in real time. This is why Apache Spark has introduced stream processing that allows to process a potentially infinite stream of data. Rich set of libraries – In addition to its core features Apache Spark provides powerful libraries for machine learning, graph processing, and performing SQL queries. If you know Scala, this code should seem straightforward and is similar to working with regular collections. First we read a list of lines from a file located in “file/path”. This file can be either a local file or a file in HDFS or S3. Implements actual streaming processing – when you process a stream in Apache Spark, it treats it as many small batch problems, hence making stream processing a special case. Apache Flink, in contrast, treats batch processing as a special and does not use micro batching. Better support for cyclical and iterative processing – Flink provides some additional operations that allow implementing cycles in your streaming application and algorithms that need to perform several iterations on batch data. Custom memory management – Apache Flink is a Java application, but it does not rely entirely on JVM garbage collector. It implements custom memory manager that stores data to process in byte arrays. This allows to reduce the load on a garbage collector and increase performance. You can read about it in this blog post. Lower latency and higher throughput – multiple tests done by third parties suggest that Apache Flink has lower latency and higher throughput than its competitors. Powerful windows operators – when you need to process a stream of data in most cases you need to apply a function to a finite group of elements in a stream. For example, you may need to count how many clicks your application has received in each five-minute interval, or you may want to know what was the most popular tweet on Twitter in each ten-minute interval. 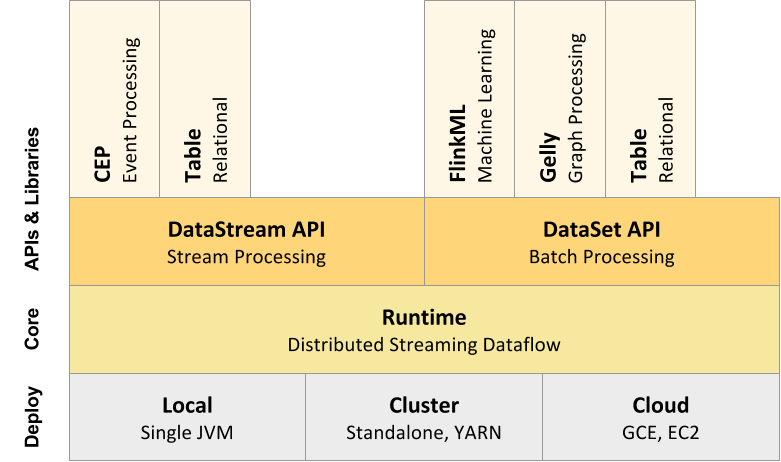 While Spark supports some of these use-cases, Apache Flink provides a vastly more powerful set of operators for stream processing. Implements lightweight distributed snapshots – this allows Apache Flink to provide low overhead and only-once processing guarantees in stream processing, without using micro batching as Spark does. If you don’t need bleeding edge stream processing features and want to stay on the safe side, it may be better to stick with Apache Spark. It is a more mature project it has a bigger user base, more training materials, and more third-party libraries. But keep in mind that Apache Flink is closing this gap by the minute. More and more projects are choosing Apache Flink as it becomes a more mature project. If you want to know more about Apache Flink, you can take a look at my Pluralsight course where I cover Apache Flink in more details: Understanding Apache Flink. Here is a short preview of this course.